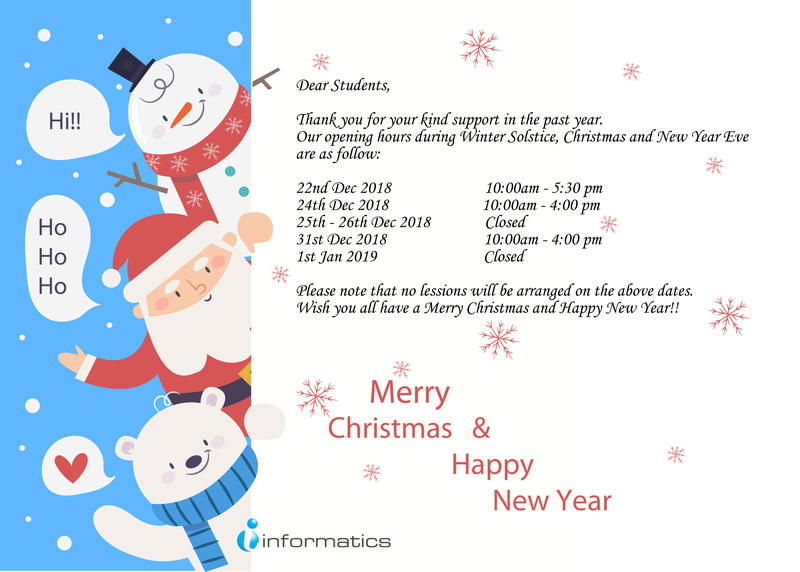 Please be informed that all classes scheduled on 22 Dec (Saturday), 24 Dec (Monday), 25 Dec (Tuesday), 26 Dec (Wednesday), 31 Dec (Monday) and 1 Jan (Tuesday) will be suspended for Christmas and New Year Eve respectively. 22 Dec 2018 10:00a.m. – 5:30 p.m.
24 Dec 2018 10:00a.m. – 4:00 p.m.
31 Dec 2018 10:00a.m. – 4:00 p.m. The School will resume its services on 2 Jan 2019 (Wednesday) as normal.